Guide To Los Alcazares, Costa Calida, Spain. Los Alcazares is located in Spain’s Costa Calida. The nearest airports to book flights to Los Alcazares would be Alicante or Murcia. Both within a thirty minute drive away from the resort. Once at the airport you have a range of different airport transfer options to Los Alcazares including private shuttle buses, taxis or Los Alcazares car hire. People tend to book villas or apartments to stay during their vacation, but if you would like to spoil yourself and stay in a hotel the following so come highly recommended Hotel Costa Narejos, 525 Hotel, Hotel Cristina, Hotel Spa Torre Pacheco and Hotel Traina. Use the Los Alcazares car hire price comparison website tool below to quickly find the cheapest car hire for Los Alcazares in Spain in just seconds. The free price comparison search engine below will compare all the current Los Alcazares car hire deals and car rental rates to give you the lowest and cheapest car hire for Los Alcazares. The seven main beaches of Los Alcazares are Las Salinas, Los Narejos, Las Palmeras, El Espejo, Manzaneres, Carrion, La Concha. The nearest golf course to Los Alcazares is the Roda Golf Course although within a short drive away from Los Alcazares you will find a few more golf clubs which include La Manga, Torre Pacheco, Las Ramblas, Campoamor, Villamartin and Mosa Trajectum. Los Alcazares also boast warm mineral springs dating back to Roman times owing to the salt properties of the Mar Menor. The local tourist office offers a service where they can help you find accommodation in Los Alcazares. There are hotels, pensions, apart-hotels and hostels. For instance for Los Alcazares hotels there is the Hotel Costa Narejos, 525 Hotel, Hotel Cristina, Hotel Spa Torre Pacheco and Hotel Traina. When looking for Los Alcazares apartments to rent try the popular El Divino apartments, the Albatros Residencial, El Valle, Euromarina, La Torre and Roda Golf. The Los Alcazares Hotel Cristina is a reommended choice for your hotel accommodation in Los Alcazares, on the Costa Calida in Spain. One of the cheapest options it is however situated close to the town and the beach. The hotel is ideal for both business and leisure purposes. All rooms have air-conditioning which some other hotels in Los Alcazares do not. The hotel is in a good spot for accessing all the golf courses which surround Los Alcazares, and is also handy for the airport and for visiting the cities of Cartagena and Murcia. 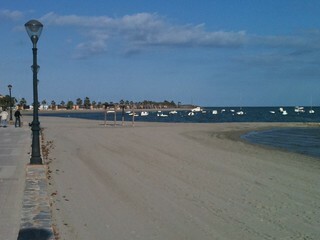 Los Alcazares faces the Mar Menor Sea and has safe, sandy beaches and warm, healthy bathing waters. Los Alcazares has a wealth of restaurants to visit, on any given vacation it seems impossible to visit more than once. Here is a list of the most popular ones. 525, Alaska, Amy’s Bar, Baccus, Bar Las Lomas, Bayside, Big Ben’s, Bygones, Café Real de la Feria, Casa India, Casa Miguel, Chino Mediterraneo, Diva, El Chato, El Chispazo, El Fogon, El Jardin, El Patio II, El Patio IV, El Tio Pencho, Chino El Velero,Fitzer’s Bar, Henry’s Bar, Hindustani Roti, Jimenez, La Bolsa, La Encarnacion, La Minera, La Olivera, La Pequeña Biancha, Piramide, Las Palmeras, Los Dos Hermanos, International, Los Narejos, Los Vagones, La Petanca, La Rambla, La Serena,La Torre, Marrakech, Meson El Palmero, Meson Los Falores, Meson Tio Flores, Mike’s Bar, Nico, Pagan, Penny Farthing, Pinoccho, Pizzeria Angela, Pizzeria Casa Peñalver, Pizzeria La Rucola, Pizzeria La Sombra, Pizzeria Venecia, Prinzipado, Pub Cocktail, Roblemar, Royal India, Ramon, Run, Sizzling Punjab, Terra Mare, The Celt, The Arches, New Salsa, Venta El Puerto III, Venta Simon, Verdelli and Zarcos. Whether you’re looking for a place to rent or to stay at permanently, you can take advantage of the services from the real estate agents in Los Alcazares who are more than willing to help you in finding your ideal residence. You can contact The House Hunter (www.househunterspain.com, Tel. +34 968 582 023); Hartland Property (www.hartlandproperty.com, Tel. +44 757 2829 148); and Alhambra Villas (www.alhambravillas.com, Tel. +34 968 574 351). Angela, what would you say would be the advantages to living in Los Alcazares compared to other Costa Calida towns? LA has a thriving population of permanent residents and is not purely a holiday resort. The bar, restaurant, shops etc are open all year round. The climate is better than most areas as we are protected from the Med by La Manga and the Mar Menor itself. It is also incredibly flat, not a hill in sight making it ideal for all ages. I enjoy the traditional markets which we have twice a week, every Sat and Tue. I would say it’s not suited to younger adults (18-25) the population consists largely of 40 plus age group, in particular families with young children, 40 something’s who work and run a business and of course the retired. The stunning beach which just goes for miles, I enjoy watching the kite surfers and the sailing boats, going for long bikes rides around the coast and also being in the Old Town. Tropical which is celebrating its 80th birthday this year, the tapas, wine menu, décor & staff are all simply superb. Rosalind’s really is a 5* restaurant and based on a rooftop with lovely views of the town centre. El Patio is a huge Spanish restaurant where the food is also very traditional and superb. Sibarit is a great local bar which caters to all nationalities, La Zona bar is excellent with friendly staff and has free games and activities for kids in addition to hugely popular quiz on Thursdays. My goodness there is a huge variety of them all, I would say at least 4 dentists and doctors, the newly built Los Arcos hospital is 5* and only 10 minutes away. There is huge variety of shops everything from boutique, shoe shops, several Chinese bazars which sell everything through to second hand and charity shops. Senoria de Roda is a fantastic village just outside LA, it has a lovely church and of course “The Hacienda” an extremely large property which is steeped in history and owned by the royal family, the kings brother visits with his family every summer. San Cayetano is traditional village with a great mix of residents, it even has a Michelin star restaurant. Las Claris school is in Los Narejos and has an excellent reputation. We also have Kings College, a private school that caters for all nationalities too. Not at all, we suffer petty crime in the summer months like bicycles being stolen etc., I have lived here for nearly 10 year and never seen or encountered any issues. Prices have increased around 12% in the past 18 months and remain stable we envisage seeing continued steady growth, the demand for mortgages increased by 34.1% in May, its highest since 2012, the long term rental market is also at its highest since 2007. The majority of bank repossessions have gone now along with all bargain basement properties. In comparison to other local towns LA is more expensive that is largely due to the vast array of facilities, the airport which is 3 min drive, the beaches and of course the climate. We are very protected by the Mar Menor so have increased temperatures and very little bad weather – even in winter. The town is really split into 3 parts, Los Narejos which is largely traditional dwellings where permanent residents live. The town centre which has a lot of apartments many of which are rented out to holiday makes in season and the Old Town which is very traditional and Spanish. The permanent population is around 17,500 we jump to 250,000 in high season. How much are the typical property prices in Los Alcazares for apartments, villas etc? That would depend on the part of town – Los Narejos and the old town you could get an apartment for as low as 45,000 euros and a nice villa on a good sized plot for around 190,000 euros. Town centre an apartment would be around 110,000 and a villa around 360,000. Any tips and advice to people looking to buy in Los Alcazares or surrounding area? Certainly to explore the entire town and its surrounding small villages, outwith the town centre prices can be dramatically lower however for those wishing to earn revenue from their property the town center can give as much as 42 weeks a year in holiday bookings. Angela, thank you so much for taking the time to help our readers with your experiences in Spain. If you want to contact her, you can find her details below. There is something for everybody in Los Alcazares so when are you coming? This video presentation shows the stunning beaches that you can find in Los Alcazares. Page Summary – This page contains useful Los Alcazares information for people intending to visit or holiday in Los Alcazares. Dont fix what is not broke.